This Tuesday (17th June), sees the return of the Car Treasure Hunt. Starting with an hour’s worth of staggered starts from 6:30pm from the Football Club West End Ground, Somersham’s drivers and their passengers are invited to take part in a treasure hunt that will see them tour the area competing for the Claire Kirby Memorial Trophy. Adults: £3.00, Children £1.00 entry (which includes some light refreshments). The winners will be announced, and the trophy presented, at 9:30pm. 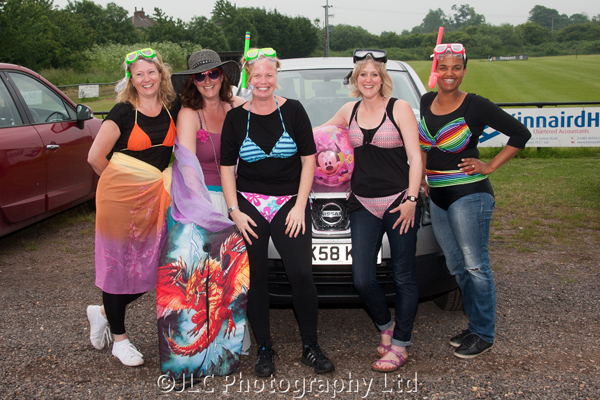 The Somersham Snorklers won ‘Best Costume’ at last year’s Car Treasure Hunt. Photo: JLC Photography Ltd.
There’s also a prize for the Best Team Fancy Dress in this year’s Carnival ‘Commonwealth’ theme. Last year’s winners were ‘Buckets and Spades’ (Anne and Clive Desborough, and Lynn and Derek Martin), and ‘The Somersham Snorklers’ won best Fancy Dress (pictured). Don’t forget, there’s lots of activities still to come – check out our What’s On guide.